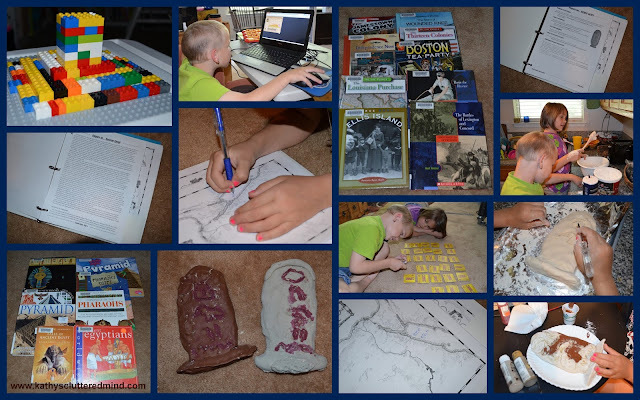 I don't know about you but I really LOVE homeschool curriculum products created by homeschoolers! Home School in the Woods was created by Amy Pak a homeschool mom to 6 (and yes they live in the woods). She started offering unit studies in 1998 but it wasn't until 2002 that Home School In the Woods was created. Home School In the Woods creates history unit study paks and lapbooks for 1st-8th grade age children. We have been using Great Empires Pak in our homeschool for the last few weeks. We have been having so much fun learning history, geography, art and more as a family. 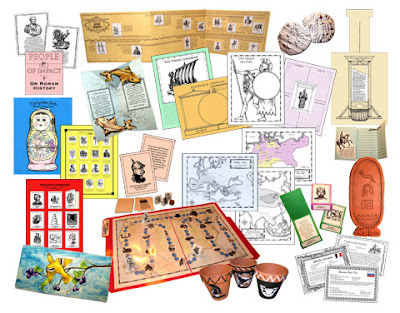 These fabulous unit study paks really help bring history alive as well as make it very hands on. There are 35 fun projects included in the Great Empires Pak! The kids decided to start with Egypt. We are just finishing up this unit though because we decided to really delve deeper into the subject (my kids love Egypt). After I printed the Ancient Egypt materials (which I 3 hole punched and stored in a binder) we visited our local library to find books about Egypt. If you need some help don't worry Home School in the Woods has a list of reading suggestions. As well as a list of AMAZING internet resources (which includes games, reading material, videos and more). For each of the 14 empires there is reading material, mapping activities, recipes, game ideas, etc. All of the masters are provided for the projects along with assembly instructions which makes the busy homeschool moms job so much easier. I really like how flexible the unit study paks are. You can choose to do only the provided projects or do as we did and delve even more into the topic by reading additional books and visiting the recommended internet resources. You can totally tailor the unit study to fit your families needs. It may take one family a month to cover all the empires...or it could take an entire year! The Home School in the Woods paks are great for all learning styles and homeschool methods. It should take about 1-3 days to cover each empire however Egypt took us almost 4 weeks, because my kids picked out lots of books, watched documentaries on Netflix about Egypt and watched lots of Egypt YouTube videos. We also added some of our own projects like building a pyramid out of Legos and playing our History For Kids Ancient History Matching Game. And we even added a fieldtrip to the Michael C. Carlos Museum which has a great Ancient Egypt exhibit and offers FREE days once a month. Oh and we added a few items to our timeline also. The next topic we are starting hopefully this week is "The United States of America". Here are some photos of the projects we did and books we used. My children's favorite online resource was the mummy embalming. Gwyn, "I liked making the scroll and the mummy game." Rowyn, "I liked making a pyramid." We had lots of fun reading with mommy and playing. The download version of Great Empires which is what we reviewed is $18.95. There is also an option for a CD version which is $19.95. Click here for more Home School In The Woods reviews from the The Schoolhouse Review Crew. We actually finish this yesterday. It was so much fun & we learned a lot!! !